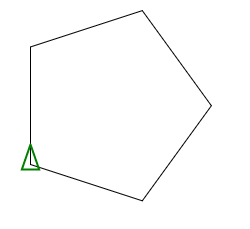 The goal of this code golf is to draw a regular polygon (one with equal side lengths) given the number of sides and radius (distance from center to vertex). 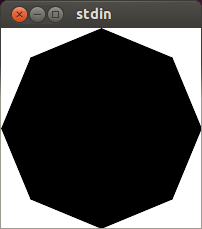 The number of sides and the radius can be entered via a file, STDIN, or just a plain old variable. Use whatever is shorter in your language. 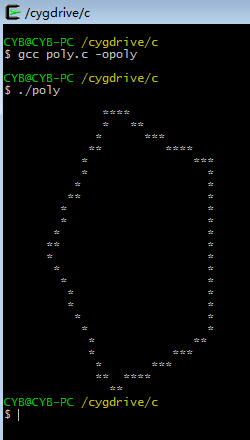 -25% of total characters/bytes if the image is actually drawn instead of ASCII art. 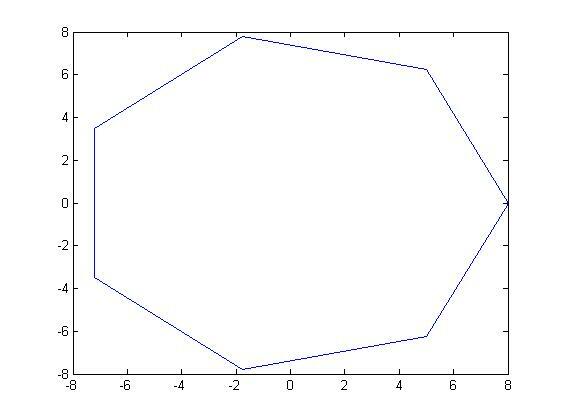 Well, it's Java :/ Just draws lines, point to point. 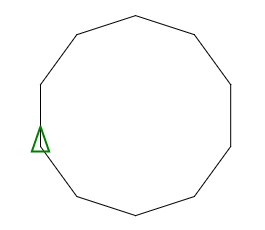 Should work for any arbitrarily sized polygon. Cut it down quite a bit from original size. Huge credit to Vulcan (in comments) for the golf lesson. If the connection between the first and last point do not need to be smooth, then --cycle could be removed, saving 7 bytes. If you count in characters instead of bytes, this would be 41 – 25% = 30.75 characters. 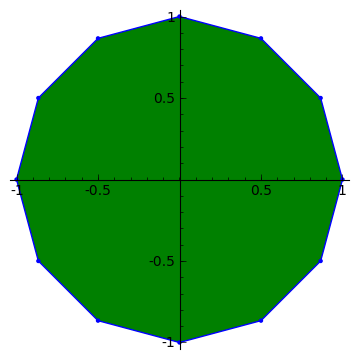 Assumes the radius is stored in the variable r and the number of sides stored in the variable s.
This uses the cosine theorem c2 = a2 + b2 – 2 a b cos C to calculate the side length from the given radius. 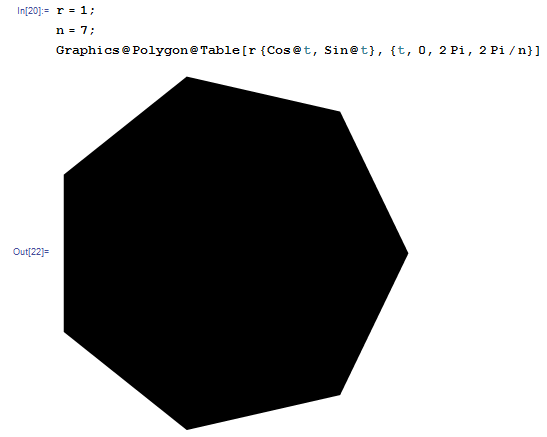 And it's the only program that outputs the polygon in ASCII instead of drawing it. Because of this and some floating point rounding issues, the output doesn't look particularly pretty (ASCII Chars are not as high as wide). I don't even think there's a point for an ungolfed version. It would only contain more whitespace. 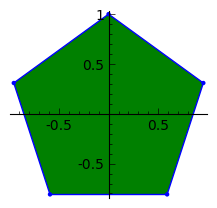 Expects the radius in variable r and number of sides in variable n. The radius is a bit meaningless without displaying axes, because Mathematica scales all images to fit. Translate to the center, scale up to the radius, move to (1,0); then repeat n times: rotate by 360/n, draw line to (1,0); draw final line, stroke and emit the page. 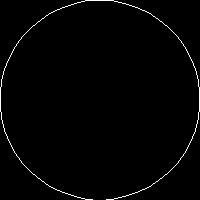 Assumes the number of sides is stored in the s variable and the radius is stored in the r variable. 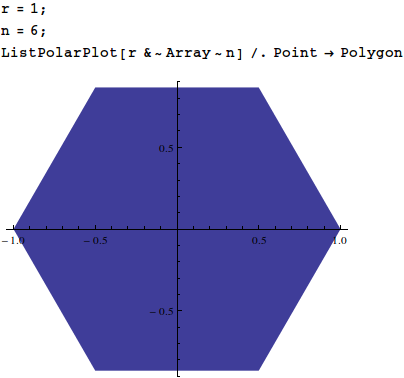 This code uses N Complex Roots of unity and translates the angles to X,Y points. 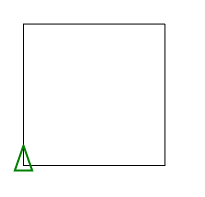 Then the origin is moved to centre of the canvas. 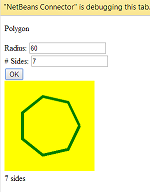 This code requires HTML5 canvas element, c is canvas object, r is radius and n is # of sides. 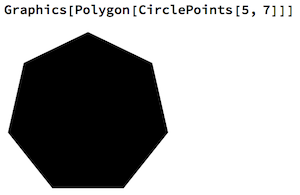 Assumes two predefined variables: $p the number of points, and $r the radius in pixels. Alternatively, one could prepend list(,$r,$p)=$argv; and use command line arguments instead. 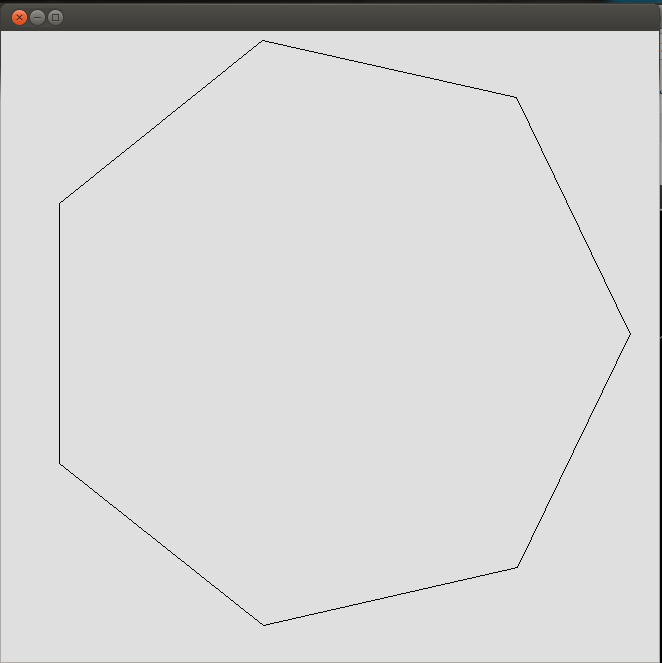 Output will be a png, which should be piped to a file. 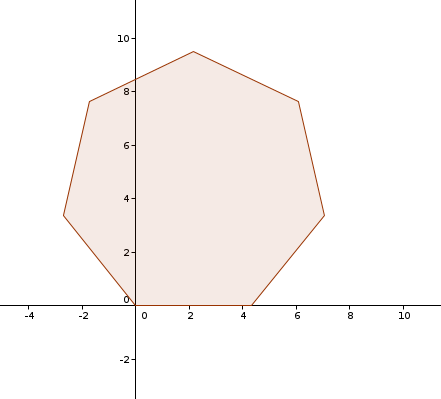 It works by drawing a circle with a very low number of steps. 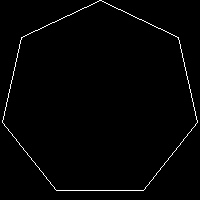 For example, a pentagon would have steps of 2π/5 radians. The window settings are good enough by default, and TMIN and TMAX are set to 0 and 2π, so all we need to change is TSTEP. 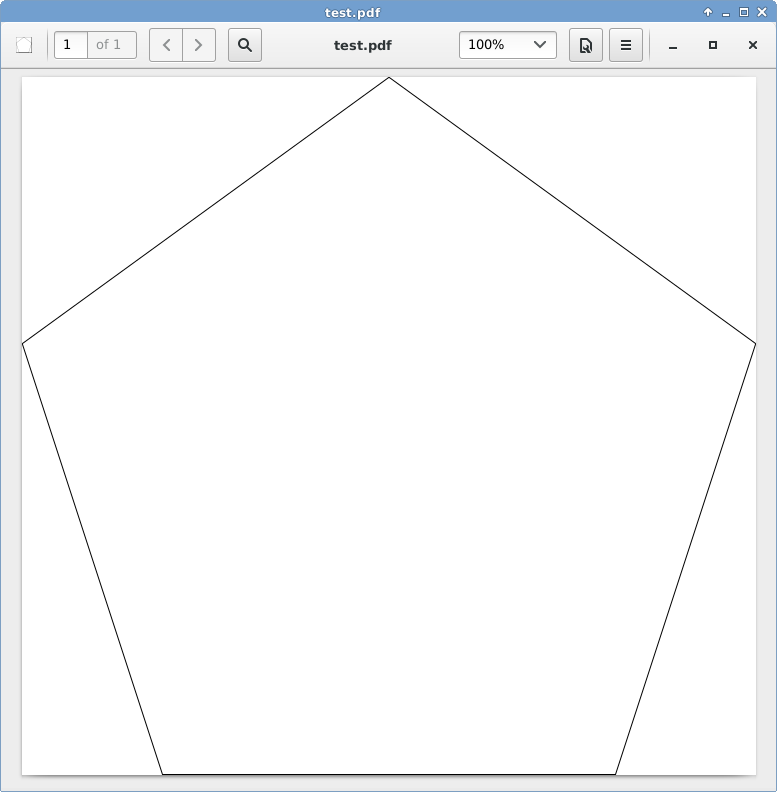 Takes the sides and radius from INPUT, calculates and stores the points, and then draws them by using GLINE. I feel like this could be shorter but it's like 1 AM, whatever. Assumes a clean and default display env, so you might need to ACLS when running it from DIRECT. First post here! I know I'm late to the party, but this seemed like as good a question as any to start with. Call using p(n,r). 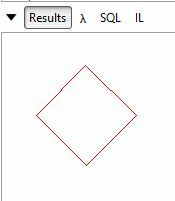 I did this in LINQPAD as it's got a built in output window. 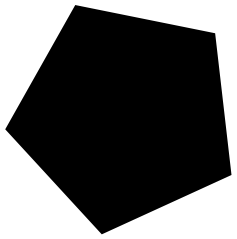 So essentially you can drag and drop the following in to it and it'll draw the polygon. Just switch it to 'C# Program', and import the System.Drawing lib into the query properties. You can shave off some bytes if r and n are already in the workspace. 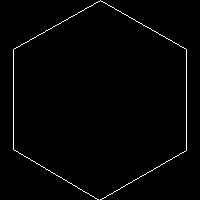 Checks if a pixel is on the inner side of all hyperplanes (lines) of the polygon. 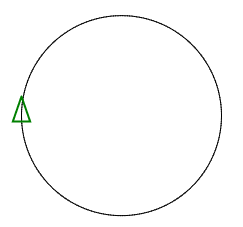 The radius is touched because actually the apothem is used. Input is in the variables r,n. If included in the count, it would be r,n=input(), for 12 bytes more. Variables S and R are used for input. The sides are drawn using the color -I, which is usually close to -1 (&HFFFFFFFF white) (except when I is 0, when it's transparent). 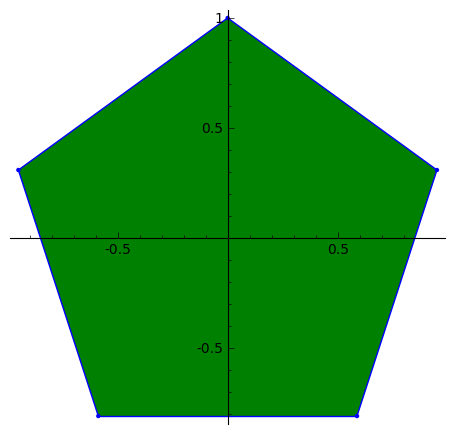 This solution uses the tikz library shapes.geometric. 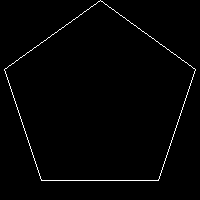 Here is what a polygon with 5 sides and radius 8in looks like when viewed in evince. Not the answer you're looking for? 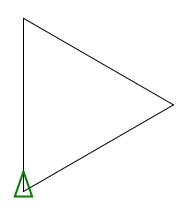 Browse other questions tagged code-golf graphical-output geometry trigonometry or ask your own question.